"This book is especially welcome because of the scholarship and thoughtfulness evident throughout." How do child protection professionals and courts make judgments on whether serious injuries to infants are due to abuse? If injuries are considered to be the result of abuse, in what circumstances can it be considered safe for the infant to return home? 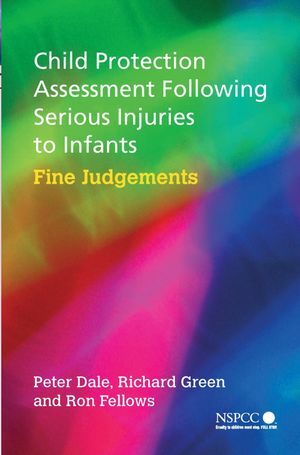 Child Protection Assessment Following Serious Injuries to Infants is concerned with helping child protection professionals and courts make the right decisions and avoid errors that can have disastrous consequences for children and families. Reviews research on the causes of child abuse and problems in diagnosing abuse. Examines the views of parents who consider that they have been wrongly accused of child abuse. Draws specific attention to the need to assess potential for change in families and considers in detail how this can be achieved. Highlights skills issues that are necessary for undertaking appropriate assessments. Identifies key factors that are indicative of reunification in some cases, and factors that contraindicate reunification in others. With its evidence-based approach, this book will be a valuable resource for all child protection professionals. It will also be of use to health professionals, legal professionals, researchers, lecturers and students of social work. Richard Green trained as a social worker and family therapist. He has held a number of posts in both local authorities and the NSPCC, including practitioner, manager and evaluation officer. he is currently employed as Senior Consultant with in the NSPCC, working with a range of statutory and voluntary agencies to improve the safeguarding of children. Ron Fellow trained originally as a social worker, and subsequently as a family/brief therapist. he worked in mental health and children and family services for various London boroughs. Since joining the NSPCC, he has held posts as a practitioner and manager. 2. Child Abuse and Child Protection Errors. 5. The NSPCC Serious Injury–Discrepant Explanation Research. 6. Parental Perceptions of Child Protection Interventions. 7. Explanations for Injuries and the Thorny Issue of ‘Denial’. 8. Child Protection Assessment Contexts.